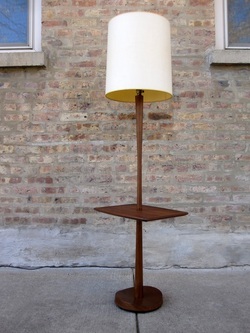 This is a beautiful walnut floor lamp with side table made by the Laurel Co. circa 1960's. The base has a great sculptural form along with a tapered walnut pole. The shade is a cream colored fabric which is original. The small table is great for a couch-side drink. Nice condition!